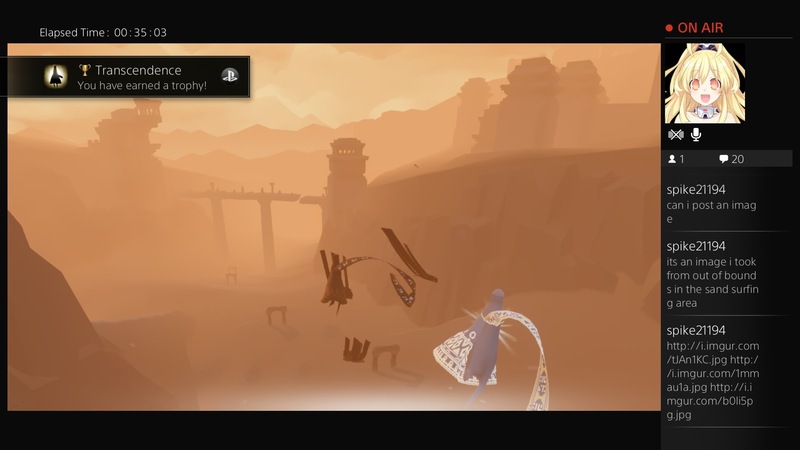 [GAMES] Journey PS4 100% Completion! OT: I am disappointed to see that screenshots during streams include the actual streaming information. Ew. 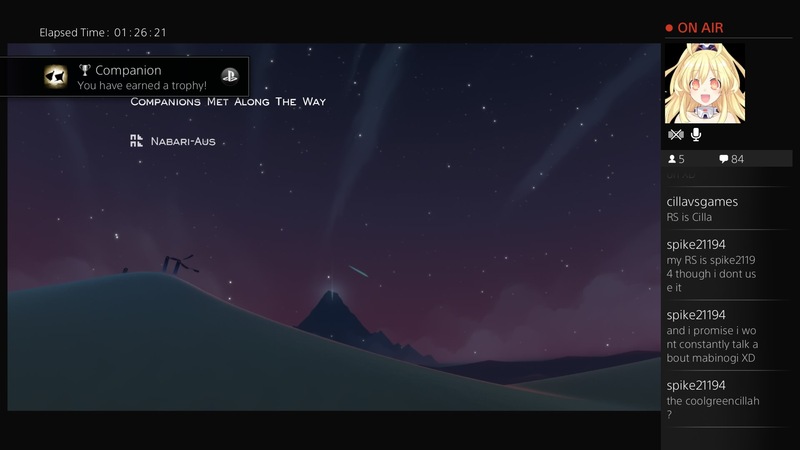 Having recently beaten Journey once again on PS4, I decided to achieve 100% trophy completion for the second time. This was a pretty smooth process as I remembered most of the glyph and symbol locations from playing it on the PS3. In fact after my run through I was only missing one symbol and that was due to me just missing the ramp during the surfing area. The hardest trophy for me was actually Reflection. I tried to get it as soon as I met up with someone in my first run and they literally had no idea what I wanted. I called to them and they would rush over and I would meditate and they would call me to keep going. We literally went through this process at least twenty times until I gave up and tried to find a different partner. After three or so partners I finally found one who knew what I wanted to do. When I originally got 100% I actually earned the Companion trophy with a friend I know in real life. We went through the portal at exactly the same time and ended up partnered up together. It was awesome! This time around I found it a lot harder to find someone who didn’t bail half way through. That is until I streamed my play through today in the hopes that I would find someone. I instantly found a white cloak who wanted to show me everything there was in the game. They didn’t seem to understand that I didn’t want or need to go see the flower or FLOW creature so we ended up literally everywhere. I found this to be ohkay as I am a veteran player and knew these things anyway. It definitely would have been a disappointment though if it was my first time and I didn’t have the time or luxury to discover the secrets myself. Now that I am a white cloak again I think I may do a few more runs with the little red cloaks. Though I will definitely let them take the lead and explore. Help them if they need it. Oh, Journey is amazing. ← [BLOG] Harry Potter Trivia Night!